The Mostly Color Channel: What is your energy footprint? In the USA, tucked into a 1,500-page budget bill now moving through Congress is a Republican provision that would restore the incandescent light bulbs that were supposed to be phased out in favor of greener lighting technology. Defenders of the traditional bulb say the government is again overreaching, that the marketplace should decide what kind of bulbs are manufactured in the USA. Led in the House by Rep. Michael Burgess, R-Texas, Republicans got the funding cutoff provision inserted into an energy and water spending bill that President Obama signed into law in mid-January 2014. With this freedom of conspicuous consumption, according to the Wikipedia the average USA person consumes 12,000 watts of energy. By comparison, a person in Bangladesh on the average consumes 300 watts. The world average is approximately 2000 watts. Of course, the people in Bangladesh and elsewhere in the world would like to enjoy the same conspicuous consumption as USA people, so world energy production should increase to 7,148,400,000 × 12,000 = 85,780,800,000,000 watt. As Dr. Marco Morosini wrote in a paper on the 2000 Watt Society, in the last decades some authors suggested to consider the opportunity of a voluntary ceiling to the amount of primary energy used per capita. Wolfram Ziegler proposed a voluntary limit in the use of primary energy in central Europe under the level of 0.16 W/m2 (Ziegler 1979; 1996); this level was based on ecological arguments and was intended to limit the anthropic pressure on biodiversity. Starting from Ziegler's arguments and data, Dürr calculated and suggested a global value of 9 TW as a voluntary limit in the use of primary energy by mankind (Dürr 1993); this level would be around one fifth of the amount of solar energy transformed by terrestrial organisms, estimated by Dürr at 40–50 TW, for a human population of 6 billions at the end of the last century, Dürr suggested consequently the vision of a "1500-watt society." Goldemberg et al. (1985; Goldemberg 2004) claimed that 1000 watt of primary energy per capita would cover "basic needs and much more." Spreng et al. (2002) suggested to steer human societies towards an "energy window," defined by a lower social limit and an upper ecological limit in the use of primary energy. In Switzerland, the idea of setting a ceiling to energy usage was formulated at the beginning of the '90s (Imboden et al. 1992; Imboden 1993). 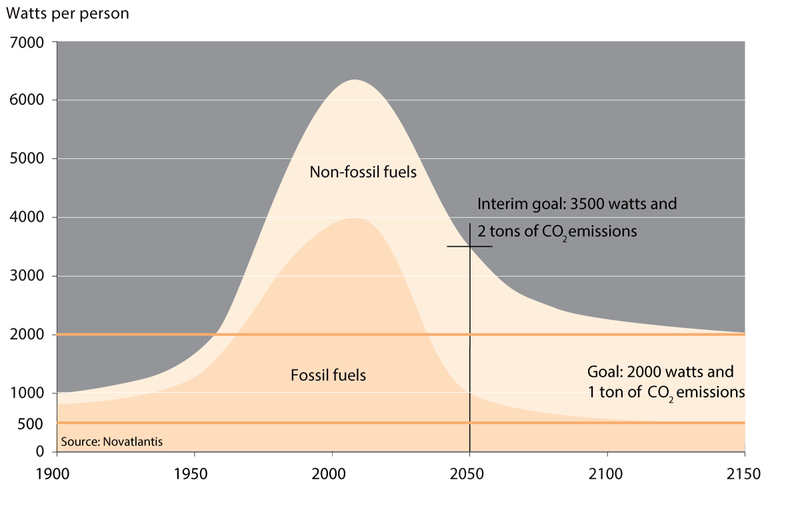 Paul Kesselring (Paul Scherrer Institute, Switzerland), and Carl-Jochen Winter (German Aerospace Research Establishment, DLR) punctually suggested a "2000-watt society" as worldwide plausible vision achievable within 50–100 years (Kesselring and Winter 1994). Primarily through the tireless efforts of Prof. Dieter Imboden, Switzerland is now on the path of a 2000 Watt Society. If you want to learn more on the 2000 Watt Society, the best source is the brochure Smarter Living made available by Novatlantis. A 2000 watt person would consume 17,500 kilowatt hours or 1750 liters of petroleum over the course of a year. You can easily calculate this number from the information provided by your utility company. For example, in Palo Alto you go to www.CityofPaloAlto.org/HomeEnergyReports. In my case, from 18 June 2009 to 21 January 2014 I have used on average 308 watt of electricity and 1092 watt of gas for a total of 1400 watt, so at first sight I might have reached the year 2050 goal. 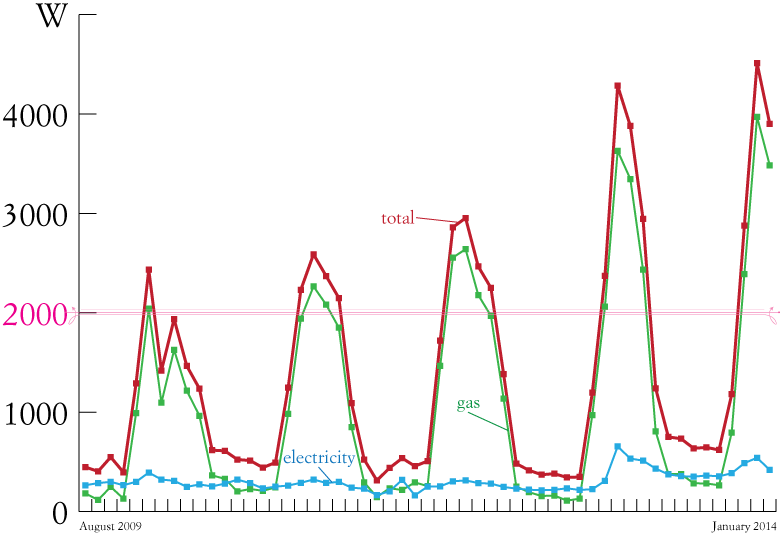 However, the standard deviation of my gas energy usage is 1070, so clearly the average is not meaningful and I have to look at all the data. My problem is that in the cool season I use too much natural gas for heating. The baseline for gas are the on-demand water heater and the cooking stove, while the baseline for the electricity are the refrigerator, lighting, and the electronics. In the cool season electricity use goes up a little because the heating furnace uses an electric fan. As explained on page 16 in the Smarter Living brochure, only 20% of the overall heating energy demand can be determined by the behavior of the building's occupants. 80% of the ultimate energy needs are determined at the planning stage of a building. In 1960, when the Swiss were using 2000 watt, I was living in a new building made of bricks, cement, insulation, double pane windows, and rolling shutters. In 2014 I live in a typical 1948 California ranch house with no insulation, so I cannot do much better. In fact, according to the utilities department I even use less natural gas than my neighbors. The reason I use more gas energy is that my neighbor's houses are mostly newer and therefore have solid plywood walls and some insulation. 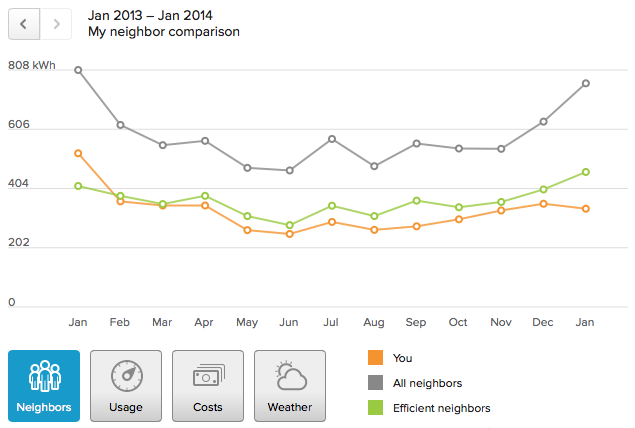 By efficient neighbors, the utility department refers to the most efficient 20 percent of my immediate neighbors. 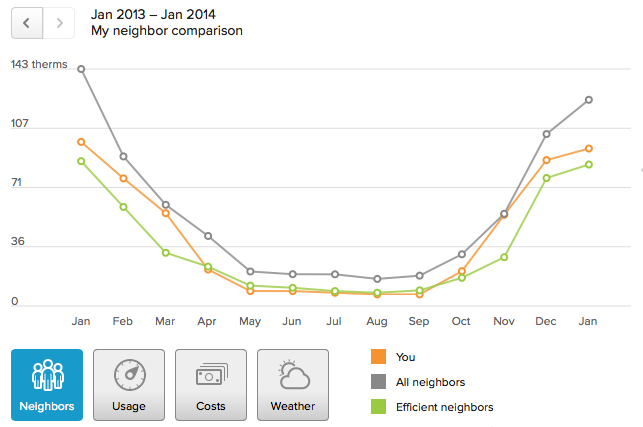 Also my electricity use is not out of line with that of my neighbors. This means that even with the 20% savings maximally possible with a retrofit, if I really want to be a 2000 watt person in Palo Alto I would have to tear down my house and rebuild it. This might be possible in rich Switzerland, but not in the impoverished USA. There could be a potentially different way out. In 1960 we had a very low energy use because we were 5 people living in a two bedroom apartment, while now the occupancy of the current 176 m2 three bedroom house is much lower. Indeed, my route to work is now 23.5 km and there is no usable public transportation. My car uses about 17 liters per 100 km or 4 liters per trip. This is a lot of gasoline and I keep it lower by car-pooling and dividing the number by 2. Similarly, I could reduce my energy use at home by increasing the number of residents. In the intrest of full disclosure, here is the data provided by the City of Palo Alto and used in the graphs above.